Oh, literature circles. They bring to mind images of students huddled around thought-provoking novels, actively debating the purposefulness of symbolism. In reality they do carry the enormous potential to be great tools for differentiation, building student independence, increasing close reading and engaging students. However, when used incorrectly they become tedious and repetitive. 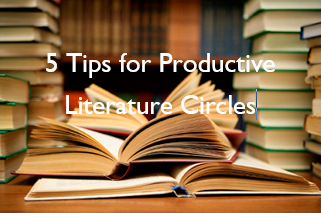 So what is the secret for facilitating great literature circles? Every year I keep experimenting with new ideas and approaches, but below are five tips and tricks I have found that have made literature circles constructive in my classroom. I created different sets of role sheets that I use for different literature circle novels to help the concept fresh. A set of Role Sheets typically has four roles I created (think Word Warrior, Conflict Crusher and other equally tacky and alliterative names). Groups need to have one member complete each role a night, however the group is free to decide who will do which one and when. I also have students complete one mini-journal a night. I give students a list of 25 topics and let each group pick their topic each night. The students write on it and then come in the next day to discuss it with their group members. For the most part, I try to let students choose as much as they can so they feel some ownership for their group assignments. If you’ve read other blog entries, you’ll notice that a common theme in my teaching is giving students ownership of lessons and units. I find that if they feel personally connected to material, they are more willing to put effort into their education. About a week before I begin literature circles, I print out “Leader Letters” and deliver them to students who I want to act as group leaders. I don’t always choose the leader based on their grade, in fact I like to choose leaders who don’t earn the best grades but show potential in order to give them confidence and a reason to be engaged. The letters explain that we will be doing literature circles and that I would like him/her to be a group leader. I say how confident I am that he/she can be a great leader and that I would appreciate his/her help keeping groups members on task. A colleague of mine suggested this idea, and I love it. The students get excited (especially since I make a big deal about of delivering the secret message) and they enjoy taking on the role of keeping their groups organized. One issue that always comes up when I have group work is a student not pulling his or her weight. To help combat that, after my first try at literature circles I created Daily Evaluation sheets. These are short, little forms (about a quarter of a sheet of paper) that the students can easily fill out at the end of every class. It gives them a chance to evaluate their peers (I use a 0-5 rating scale to make it super quick) and ask me any questions to leave direct comments. I have found that this is a great way to keep students accountable (they don’t want their fellow group members giving them low ratings) and it is a productive way for students to express concerns with you in a more private fashion, instead of having to say something in front of the entire group. This may sound a little misleading. I don’t suggest that students create their own role sheets or handouts or assign their own essays. But what I do like to do in my class is allow my students to decide on their own due dates and reading amounts. I will give students the final due date that everything needs to be read by, but I allow each group to decide how much to read each night. I have had some groups decide to finish the book a few nights early, other groups plan it out so there is no reading on weekends, and still others take out their calculators and divide the pages evenly for each night. The students really like this because they can accommodate their schedules – I often overhear students explaining which nights they have practice in order to limit the reading for that night. This is the heading of the blank chart I give each student to fill in with his/her group before starting the novel. This sounds overly simplistic – and maybe it is – but it is crazy to me how powerful it can be to just allow students to move around the classroom. When I do literature circles, the entire classroom (and usually the hallway) are open zones. Students can push desks around, sit on the floor, create circles with chairs and do whatever else in order to have a cozy spot to discuss the novel. Remember, the purpose of literature circles is to facilitate close reading and discussion – think of it as a book club in the classroom. Students should feel relaxed and comfortable sharing their perspectives. I like to have one Hallway Group. It always amazes me how excited the groups get when it is their turn to be outside of the classroom. Take a look at my Literature Circle Unit in my Teachers Pay Teachers store to purchase my role sheets, evaluation forms and student overview handouts!